Nora Lee Garcia is one of the most highly regarded flutists in the concert world today. 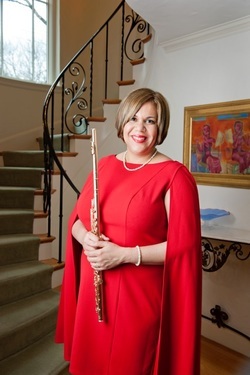 As a Powell Flutes Artist and Associate Professor of Flute at the University of Central Florida, she is in demand throughout the United States, Europe, and South America as a soloist, chamber artist, and teacher. Nora Lee has been featured as a guest artist on flute and piccolo at events such as the Mexico City Flute Festival, the East-West Flute Festival at Western Illinois University, the Chile Flute Festival, the Flute Seminar at Casa Maria in Santa Barbara, California, the Flute Symposium in Lima, Peru in honor of Michel Debost, the Florida Flute Association Convention, and the National Flute Association Conventions in New Orleans, Dallas, Orlando, Phoenix, Washington, D.C., Tennessee, Pittsburgh, and Charlotte. Nora Lee has served as a judge on the panels of the International Flute Competition in Mexico City and the National Flute Association’s Chamber Music Competition. She has premiered numerous pieces, such as Prelude and Dance by Howard Buss (winner of the 2004 National Flute Association Newly-Published Music Competition), Robert Brownlow’s Concerto for flute, chamber orchestra and vibraphone at the Interlochen Music Festival, Edmundo Vazques' Alturas II in Chile at the Escuela Moderna de Música, Orlando García’s El Silencio despues de la lluvia at the Moulin d’Ande in France, and most recently, Gary Schocker’s Under the Sultan at the 2012 Florida Flute Association Convention as a featured artist on the gala concert. An avid researcher of flute pedagogy, Nora Lee has published several articles for Flute Talk Magazine and Powell Flutes. Nora Lee is the founder and director of Flute at UCF, a program that includes the Flute at UCF Masterclass Series, the UCF Flute and Piccolo Summer Institute, and the UCF Flute Boot Camp. Through the Flute at UCF Masterclass Series, Nora Lee has hosted artists such as Sir James Galway, Michel Debost, Gary Schocker, Ransom Wilson, Hubert Laws, Jean Ferrandis, Paul Edmund Davis, Leone Buyse, Marianne Gedigian, Richard Sherman, Amy Porter, Carol Wincenc, Tadeu Coelho, Jan Gippo and Louis Herbine at the University of Central Florida. In 2009, Nora Lee founded the UCF Knight Winds, a unique urban blend of saxophone and flute choir, along with a rhythm section. The group found immediate success and was featured at the 2011 National Flute Association Convention in Charlotte, North Carolina and the 2012 Florida Flute Association Convention. A celebrated educator, Nora Lee has received several awards for her teaching and innovation, including the "Women Making History Award" for Faculty Women of Prominence at UCF, and the "Hispanic Women Who Make the Difference Award" by La Prensa, the premier Spanish newsweekly in Central Florida. Nora Lee holds degrees from the University of Miami, the Brooklyn College Conservatory of Music, and the Conservatorio de Música de Puerto Rico. Her primary teachers include Michel Debost, Bernard Goldberg, Carol Wincenc, and Bonita Boyd.